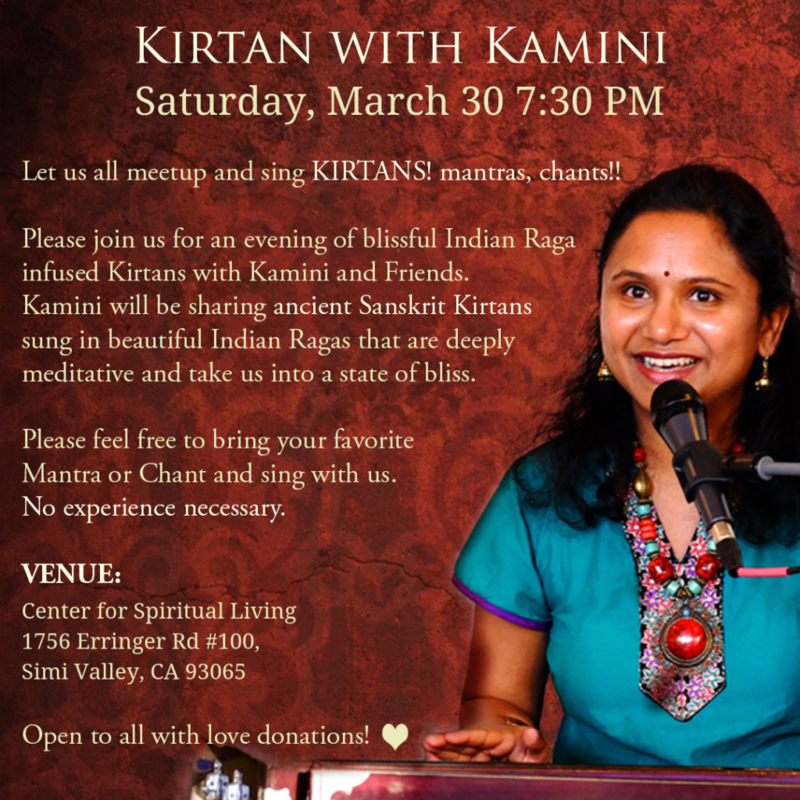 Happy to announce our next Kirtan on Saturday March 30th from 7:30PM at a NEW LOCATION in Simi Valley, CA! Lets meet, chant, meditate and Sing Kirtan!! Kamini will be sharing authentic traditional Sanskrit Kirtans infused with Indian Ragas. Indian classical music and its ancient tradition of Ragas (sacred scales) is a classical mode for practicing Kirtans. While meditating on the tones in different ragas, amazing transformations can happen. Kamini’s music is authentic and pure tone and embodies the soul of Indian classical music. Expect an extraordinary experience of a deeper and more expansive connection with Spirit that will bring you a deeper insight into your Self, your practice and your understanding of yoga. Indian Ragas based Kirtans and traditional rhythm patterns – “Taals” lift listeners into a higher state of consciousness- a state of pure bliss, away from day-to-day stress. Please bring your chants, Mantras and Kirtans. You are all welcome to lead a Kirtan as well, or bring an instrument and Jam with us.